Seat(s): There’s no way I can make this review completely fair. No, no one paid for my flight and no I didn’t win a contest. I simply got 2 open seats in Asiana Business Class all to myself. It’s a perk in any seat or class but I felt really like I won at life on this one. You see, everyone went for the admittedly awesome window seats because of their alone-ness. If you’re travelling alone or with someone you don’t particularly like, book one of those. My 3rd row middle-section seat came with a large console separating me from the aisle (lord knows I love a good aisle buffer when that buffer isn’t another person). The console for the neigboring seat separates it from the opposite aisle, creating a fort-like space. If you’re 4, a blanket draped from the backs of row 2 and over yours would be awesome. At 40-ish , I’d have looked silly doing it, but don’t think I didn’t consider it. The seat, as a seat, is comfortable. The standard “relax” setting pushes you out and into a reclined position that will keep you from cramping up. Fully reclined to sleep position your personal fortress becomes a reasonably comfortable spot for sleep but only once you’ve knocked your elbows on the walls of this relatively slim space. 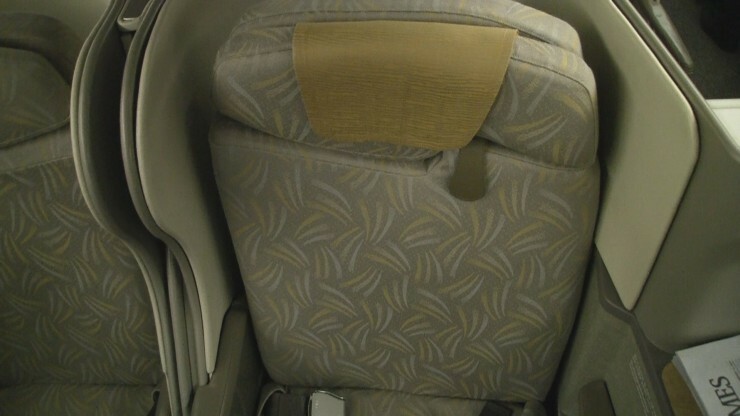 You might feel some of the seats mechanics while lying down but that bit of adjusting can help. Seat Maps: Asiana (choose 294 or 295 seat configuration). See our full picture gallery of these seats in our gallery. 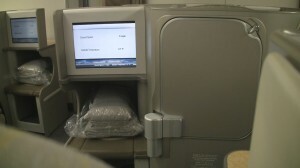 Tech/Connectivity/Entertainment: Nothing here will change the face of business travel forever, but you’ve got a decent selection of movies and entertainment built into your large personal TV. A selection of about 6-7 Hollywood movies was offered alongside a greater number of Korean and global films and features. If you brought your own device loaded with whatever movies, work or Dig-Dug era arcade games, keep them powered using the global power port in the front of your large console. While your larger device charges, your phone can use the USB for a much slower charge. I’m guessing you’ll have plenty of time. I figured that my love of rice would translate to a love for rice porridge. It did not. Food: I’m certainly no food critich but I watch a lot of the Food Network with my wife. Using verbiage I learned from shows like “Chopped” and “Worst Cooks in America” I’d say that my each course was nicely prepared, but failed to come together as a complete meal and my fruit and cheese course suffered from sloppy plating. In my own words the food was okay. The video mentions that the main plate was nicely prepared and it was indeed the shining star of the Business Class meal experience. Everything else was about average. Service: I was looking for something 5-star here and found it in the service. From boarding the experience was a pleasant one. Flight attendants were attentive and personable with us throughout the flight with frequent (not excessive) check-ins and timely meal service. It was all smiles up front. How we got em’: This was a large sliver of a Star Alliance award itinerary using US Airways Dividend Miles. The gang at PointsPros found a great all-business class trip using just a handful of miles to Asia (via Europe).